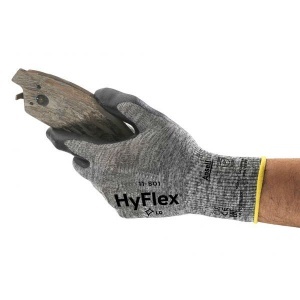 Combining improved comfort, flexibility and dexterity, the 15-gauge Ansell HyFlex 11-801 Palm-Coated Nitrile Foam Gloves are ideal for providing hand protection for a wide range of industries. They also feature a knitwrist cuff for improved wearability, and are available in a range of sizes to ensure the most comfortable fit on either hand. The product code for the pair of gloves is: 11-801. 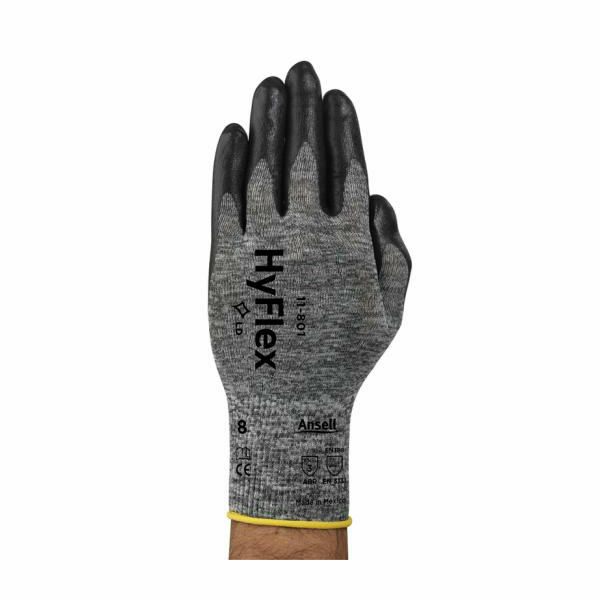 As being comfortable while you work is paramount to a job well done, the HyFlex 11-801 gloves have been designed to be as comfortable as possible without compromise to the level of protection received. They are free latex- and silicone-free to reduce the risk of allergic reactions and skin irritations, and they are also antistatic for increased wearability. They are ideal for providing combined comfort and protection in dry or slightly oily environments. The table below showcases the test results of the Ansell HyFlex 11-801 gloves according to EN 388 Mechanical Risk specifications. 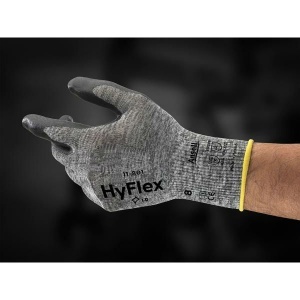 The Ansell HyFlex 11-801 Gloves are available in a choice of sizes, making them suitable for most users. Please consult the table below for details, then select the required size from the drop-down menu at the top of the page. The glove length will range from 200 - 265mm.